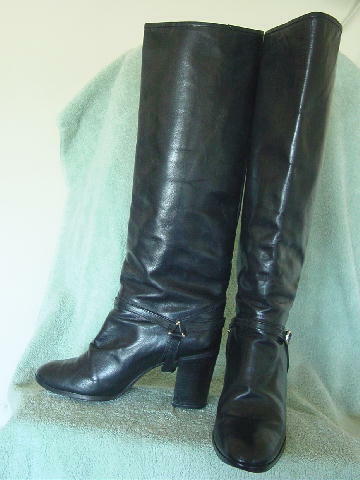 These vintage black leather boots have wood stacked heels and rounded toes. There are light brown leather linings. They have 4 decorative straps on each boot which buckle on the outer side and then one goes around the back and another strap goes under the boot in front of the heel. The straps are connected by tarnished gold-tone metal triangles with little balls on each corner. The outer upper center sides are 1/2" higher than the inner sides. The boots are by Gilioli and were made in Mexico. The back seams have a support which stops 1 3/4" from the top and gives it body. 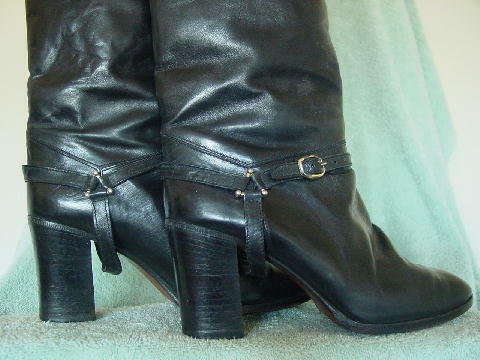 The buckles have some gold-tone coloring missing and the tip (as it nears the sole) of the left boot has a small ding, which is hard to see when the boots are worn. The boots have some light scuff marks. It's nice leather and detailing. bottom of heel to top of boot 18"